The pear-drop shape has been universally loved for its ability to create volume and its resemblance to a droplet of water. 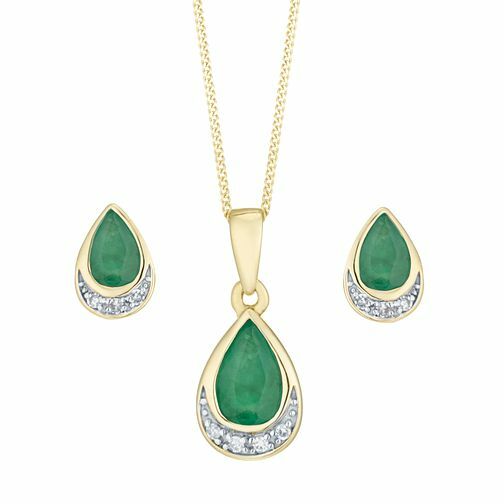 Made in 9ct yellow gold and with an emerald as the gemstone for this piece, the colour conveys the emotion that is subtly embellished with a curve of diamonds for added shine. This jewellery set comes with matching earrings and pendant to make it a loving and sentimental gift. 9ct Yellow Gold Emerald and Diamond Jewellery Set is rated 1.0 out of 5 by 1. Rated 1 out of 5 by Anonymous from This product is not value for money I am very disappointed with this item as it looks so much bigger than what it actually is. It’s just so tiny! Poor quality Looks dull and cheap. I haven’t even taken it out of the box as I am very dissatisfied.